Yesterday, I was walking our dog, Lilla, along a patch of unkempt grassy area over top of an underground rail line in one of the less picturesque parts of Rome. I take the dog there often because she can run for long stretches without encountering many people. (She’s still young and loves to jump on people with her muddy paws – she especially likes to do this to old people and children!) I also like going because there is a community garden in this space as well – though the only member of the community I ever see tending it is Antonio, a man in his middle 70s who describes himself as “un amico della terra” – a friend of the Earth. Antonio believes that we’re all too well-fed and too obsessed with food. He complained that people don’t know how to appreciate simple, well-cooked, good quality, fresh food. We talked about children and he said that children today (he actually said that – “i bambini oggi …”) are too interested in junk food and they’re not learning about quality food. He said that maybe you have to have been poor once to really appreciate something as simple as a salad. Though he’s a bit curmudgeonly and pessimistic about the current generation of young Italians, I think he has a point about appreciating simple food. Antonio came from Pescara in the Abruzzo from a family of shoe makers, but after the War there was no work in his own city. He came to Rome in the 1950s, lived with relatives and eventually managed to make enough money to survive. But those, he says, were happy times. The whole area where we were standing and talking, now an overgrown and mostly abandoned lot, was once completely cultivated by city farmers. People grew the food they couldn’t afford to buy and they shared. He said they would anticipate the sheep herders who walked through Rome in the fall offering wheels of fresh pecorino to anyone with a patch of grass where the sheep could graze. He would go hunting in the countryside as well for wild hare and wild boar. He told me how they would cut down long stalks of rosemary growing by the roadside and lay it on the bed of the truck, where they would later rest the body of the animal. He’s experienced in the art of making sausage from boar, which is something I really didn’t want to hear about, though I respect the skill and the tradition. While we talked, we walked through the rows of his garden where he’s growing broccoli, cabbage, fennel, swiss chard, various kinds of lettuce and a beautiful large and flat-leafed variety of arugula. I thought about how it is really these food values that I’ve come to love in Rome and in Italy generally. I am distressed by the proliferation of junk food and by the way that processed foods are passed off in restaurants without so much as an acknowledgement on the menu. I’m also distressed by the other extreme, the host of trendy new restaurants that are all balsamic foam and chocolate onions. He didn’t complain about those things in particular, it was more what he saw as a kind of careless gluttony – if I understood his Italian correctly – that has weakened the continuation of Italy’s great food traditions. He picked a stalk of arugula and told me that this was once a staple, fall vegetable in the region, but that now all you can find in the markets is the thin, reedy and to me, too spicy, version that the British call “rocket.” With a heaving of shoulders and eye-rolling head toss that Italians of his generation must learn from birth, he began to complain about the industrially grown food and the lack of variety. If you want good food, he said, you don’t just have to cook it yourself, you also have to grow it yourself. 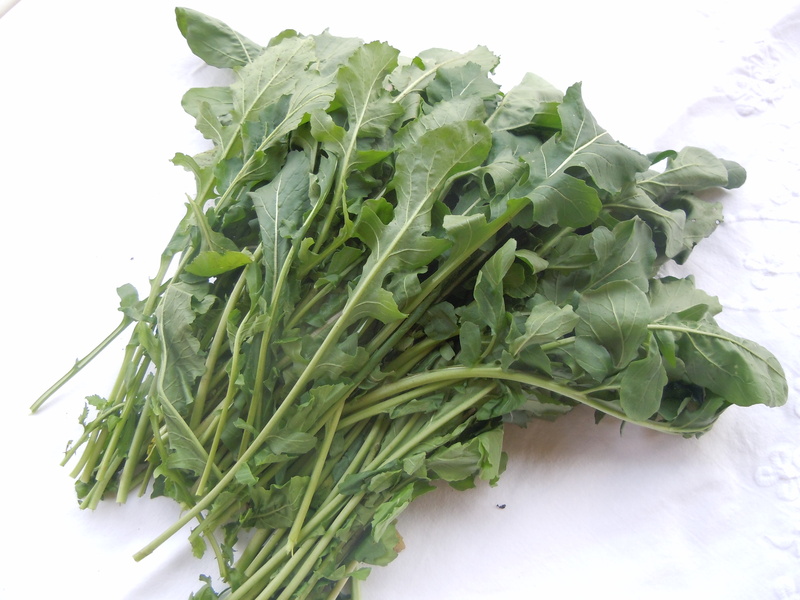 Then he picked a big handful of the arugula and gave it to me with explicit instructions on what I was to do with it – boil spaghetti in a pot of salted water, toss in the arugula a few minutes before the spaghetti is finished. Drain the spaghetti and arugula and then toss them into a warm pan with olive oil, chopped garlic and a pinch of chopped chillies. I did as I was told. I also tried it cooked directly in olive oil with the garlic and chillies to put on bruschetta that I ate for lunch. For dinner I made a fresh salad of it tossing it with olive oil from our own olive trees in Umbria and a pinch of salt. I shaved an aged pecorino cheese on top. My son, Nico, who doesn’t really love salad, ate it because of the story that came along with it about Antonio and his life, his appreciation of something as simple as a leaf of arugula. Nico really enjoyed the buttery, peppery flavour of the greens, he noticed the food, and he gave it his full attention. I told Antonio this morning about how much we enjoyed the arugula and he said he would give me more salad greens when they’re ready. In fact he said, he’ll make a garden salad for us to share one day because eating with other people is another one of his favourite things to do. If I promise to bring some of that olive oil from our trees in Umbria, he said he’ll be sure to bring a little wine made by one of his friends from the old days.